KNIGHT$ is a UK artist with a flair for penning anthemic pop songs. With one foot firmly in the present, and a discerning knowledge of music’s past, KNIGHT$ might just be the newcomer to occupy your sound system in 2019. Known for his time on stage with Scarlet Soho and the German chart act Boytronic, KNIGHT$ has made his name as an adventurous live tenor. Touring Europe alongside Zoot Woman, IAMX, Peter Heppner and The Faint, he’s also headlined The Under The Sky stage at the Montreux Jazz Festival in Switzerland. As part of Scarlet Soho he co-wrote the lead track for the German black comedy Bauernfrühstück in 2011, where he duetted alongside German classical vocalist Isgaard (Schiller). 2019 will see the release of the debut album Dollars & Cents, which was recorded in Milan and London throughout 2018. 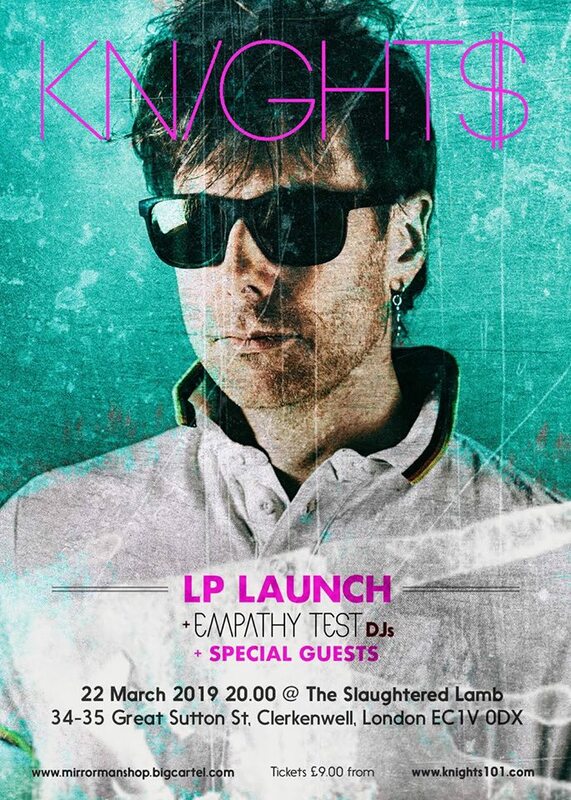 + Empathy Test DJs "London Synth Pop act Empathy Test will perform their first every DJ set playing everything from Boy Harsher to Daft Punk. Expect funky tunes and Bronksi beats."